Departures of Iberia Express: Terminal T4, floor P2, 780-789, 810-829, 840-859. Iberia Express has self check-in machines to check and print the boarding pass. They are located next to the check-in desks. Iberia Express has information counters at terminal T4 P1, boarding areas H and K.
Flight arrivals of Iberia Express: Terminal T4, floor P0. Iberia Express has the OACI code: IBS and the IATA code: I2. Iberia Express is the subsidiary company of Iberia to operate flights of short and medium distance. The airline is based in Madrid. Iberia Express has obtained in 2015 the award for most punctual low cost airline worldwide. Iberia Express operates more than 31 destinations in Spain and Europe, with a fleet of 17 aircraft. The company flies direct from Madrid to Amsterdam, Berlin�Tegel, Bordeaux, Birmingham, Copenhagen, Dublin, Fuerteventura, Gran Canaria, La Palma, Lanzarote, London�Gatwick, Lyon, Málaga, Manchester, Nantes, Naples, Nice, Palma de Mallorca, Paris�Charles de Gaulle, Rennes, Santiago de Compostela, Seville, Stuttgart, Tenerife�North and Tenerife�South. In Seasonal to: Bari, Bucharest, Cagliari, Cardiff, Cork, Edinburgh, Heraklion, Ibiza, Krakow, Malta, Menorca, Mykonos, Palermo,Reykjavik�Keflavik, Santorini, Toulouse and Zadar. For others domestic destinations, other european cities and long-distance routes, please consult Iberia flights. 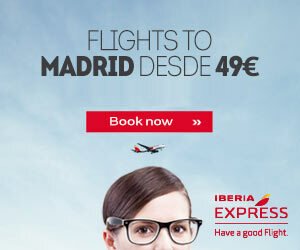 Check here Iberia Express last promotions.